Only Two Spots Left! 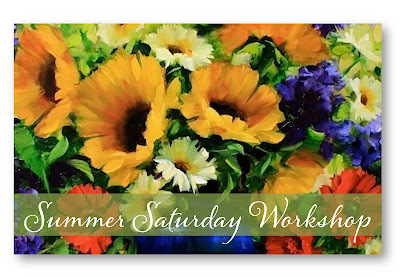 Fling your painting inhibitions to the wind and join me for a fun one-day workshop of Painting Sunflowers in Oils. We will paint loose and bright and we'll focus on loosening your approach to the still life. I'll share some simple methods for making your sunflower paintings look authentic and beautiful. Class is for beginning to advanced painters, as well as artists who have never worked in oils before. I encourage my students to bring their cameras and record each step of the painting, so they can use their images to help them long after the workshop is finished. Working from fresh sunflowers, I will start class with a demonstration in the morning, and after lunch we will paint your favorite flowers together. Bring your lunch and join me for an exciting day of creating flowers that will last a lifetime! Dozens of take home tips and shortcuts for achieving the colors you love! We can pretend we are there with you!